All-Natural Steak vs. Store-Bought Steak | Which is Better? There’s a lot of “fat” to cut through in the world of food (pun intended), especially when you consider all the talk about organic, natural, gluten free, genetically modified organism (GMO) free, free-range, grass fed, etc, etc. There’s definitely a trend towards organic and all natural steak, which tend to be considered more expensive, but are they… really? And if so, is it worth the money? If it comes to my health, then I should say it is absolutely worth the money but….Has it been proven to be better for my health? What’s the truth? Well, I don’t know…. …and this post isn’t meat to answer those questions….. However, I did become curious about one aspect of more naturally raised beef and meat. I asked myself a simple question, one I felt sure I could answer without spending hours of research on my google machine. I realize the answer to the question of “Does it taste better?” does not equate to “It’s better for me!”…..not to mention “tastes better” is entirely subjective – but nonetheless the most important measure of anything I consume! However, if IT “tastes better” AND has implications that it could actually be better for me to consume, then I decided it might be worth a try. As I’ve said before, that journey of a thousand miles begins with the first bite…. That’s a lot of “NO’s”…I’m intrigued…. As a red meat lover, I was in heaven the moment I walked into their store. They have cases upon cases of wonderful and tasty meat – bison, lamb, beef, chicken – with a wide range of cuts for each. They also have some pretty tasty sausages, (at this writing, I’m pretty excited to try the apple cinnamon sausages I purchased). Just to be clear, Red Meat Lover has no affiliation with, only affection for, this establishment. Although, I could write ad nauseam about my very positive experience with their owner and staff, and may in fact do so later, but for the purposes of this post I bought a New York Strip Steak and some other tasty meats. After that, I then purchased a NY Strip Steak from another local chain grocer, and decided to let these two opponents face off in the “Circled Square” (my grill)….. I seasoned the “opponents” the same way, placed both over the hottest part of the grill, with the exact same cooking and flip times. I wanted to ensure identical preparation so that their natural differences would shine. Once the steaks were done cooking, I let them rest for about 5 minutes. Now, time for the moment of truth…. As we bit into these incredibly tasty steaks, the first thing that was noticed was just a softer texture with the all natural steak. It’s hard to quantify THAT exactly, but it just chewed a bit easier than its chain-store bought counterpart. 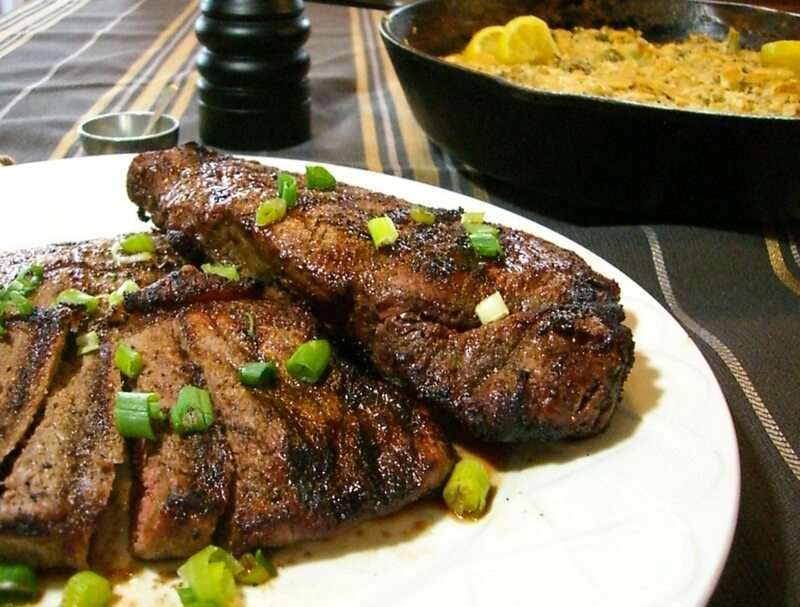 The more pronounced difference was the “aftertaste” of the all natural beef steak – again, it’s hard to quantify and admittedly subjective, but the T-Bones natural steak had a noticeably “smoother,” more “robust,” and overall “cleaner” taste. In really simple terms (because I’m a simple guy), our overall impression was that the naturally raised beef was just more tender and an overall tastier steak than its chain grocer peer. You can find our delicious Big Tasty Steak Rub by clicking the link below…it goes great with any steak!